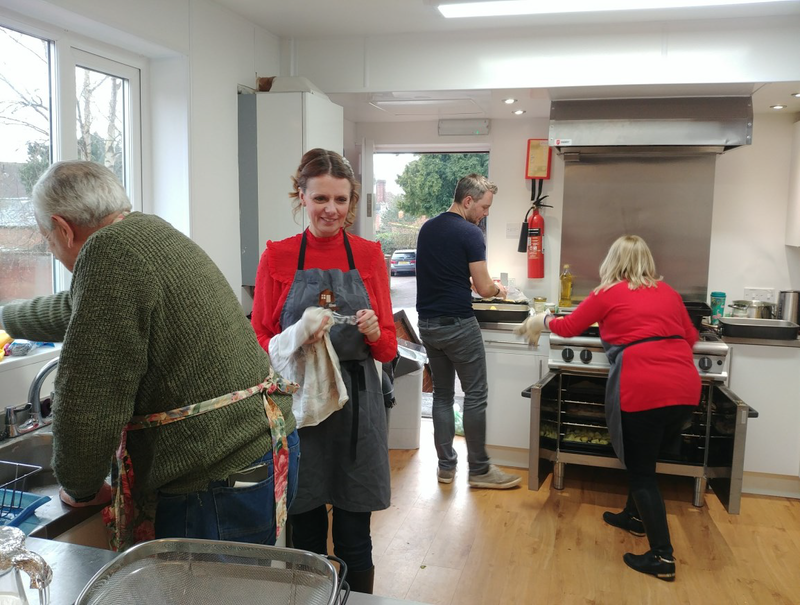 “Following a successful Christmas Day lunch in 2017, representatives from Churches Together and the Hub at Henley Community Centre met together to see if there was the will and enthusiasm to organise a Community Christmas Day Lunch again in 2018. Driven by the ambition to ensure that no-one in Henley and the surrounding areas should spend Christmas alone it was agreed to look to host the event again. With a significant financial contribution from MPA Charitable Foundation and the generous commitment of additional food, drink and equipment donations from local residents and businesses the organisation got underway. Publicity for volunteers to support the event and guests to attend was promoted across the town using leaflets, word of mouth, local newsletters and social media and the calls and emails started to roll in. One such call was from a local resident who having spent the past few Christmases alone was so overwhelmed about being invited that there were several happy tears shed on the phone. The Memorial Hall was transformed on Christmas Eve through the use of swags, lights, decorations and Christmas trees which really set the scene for the day itself. Beautiful handmade robin themed table decorations and recyclable crackers added colour to the tables. The day itself was a great success! Guests arrived at midday and were welcomed with a prosecco drinks reception and a fun quiz sheet which encouraged everyone to get to talking to each other. 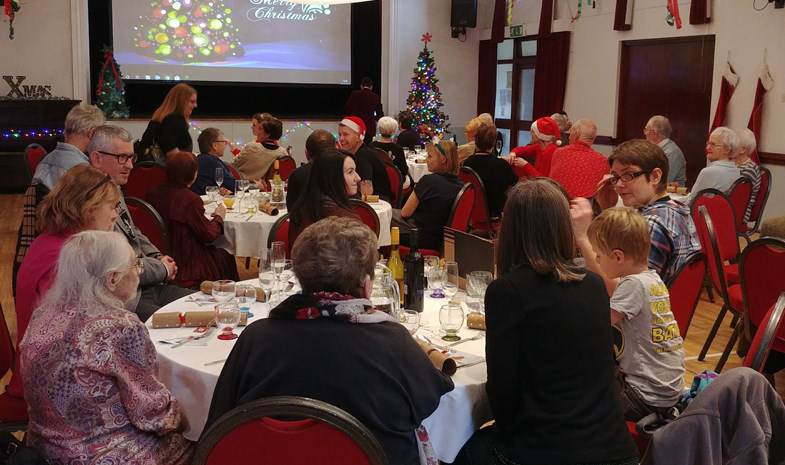 Over 40 volunteers and diners sat down together and enjoyed a full Christmas dinner with all the trimmings followed by christmas pudding or chocolate yule log. Between the two courses we enjoyed some Christmas Carols, utilising the Memorial Hall Projector and screen to ensure we knew all the words. Lunch was completed by a course of coffee and mince pies and in spite of a small technical glitch we managed to watch The Queens speech on the big screen. 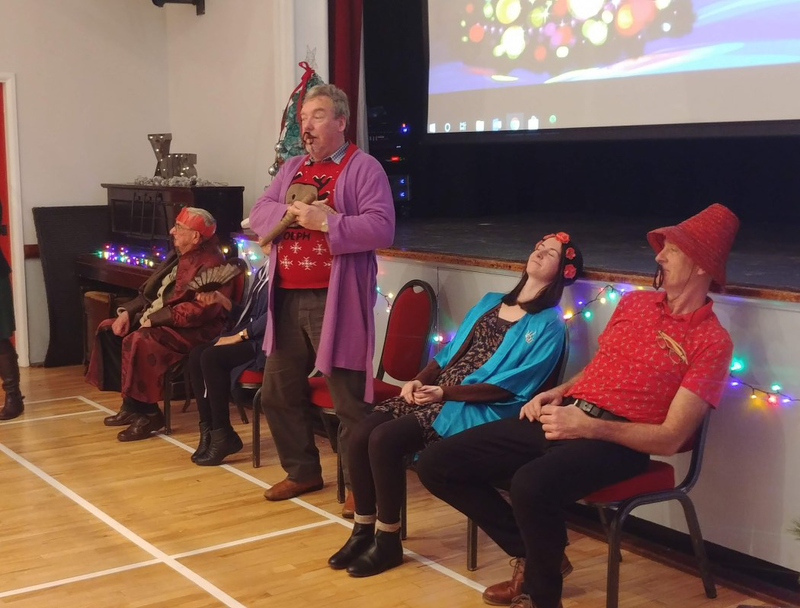 Afterwards we were treated to a short comedy skit that was prepared and performed by some of our volunteers and to ensure everyone left feeling festive a Christmas present was given out to each of the diners as they were leaving. One Guest said about the day “It has truly been wonderful, I am completely overwhelmed by it all and feel lucky to live in such a caring community”.